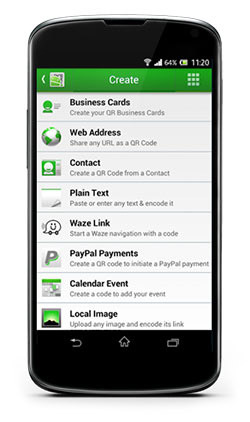 Launch the QR Droid™ application from your Android device’s home page. The application will automatically open in the ‘Scan’ tab. If there are low light conditions, then click on the light-bulb in the top right hand corner to activate the flash of your device. 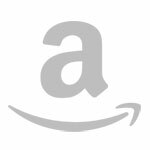 Now hold your device in front of the QR / Barcode image that you want to scan and align your device so that the image fits into the screen on the ‘Scan‘ tab. (a) Be sure that you are not holding the phone too close or too far from the code you are trying to scan. (b) You can also set cross-hairs in the Settings section, which work as a guideline for when you scan a QR or barcode. 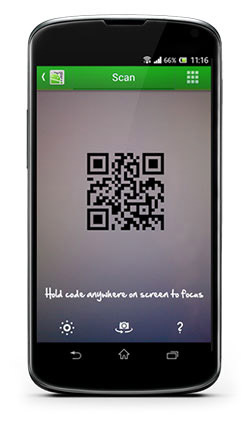 QR Droid™ will then decode the QR Code or barcode, and display the results to you. 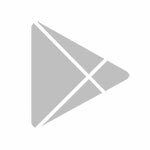 Depending on what was scanned and the results displayed, you can both search for, and shop for retail products or add contacts or events to your Android device. You can even search a location, and find it with Maps. There are many different possibilities for you to scan, simply find a QR Code and Barcode, scan it and select one of the options. Click on the 3rd tab called ‘Create’. (a) A ‘My Business Card’ QR Code where you can create a QR Code for yourself (Business Card). (b) QR Codes from your contacts. (c) QR Codes of URL’s, YouTube. (d) QR Codes for Events, Telephone numbers, email addresses. (e) QR Codes of plain text.